Hi [INSERT YOUR FRIEND'S NAME HERE], Please check this out https://www.proactivehealthcare.co.uk/biocidin-capsules?referrer=0 and get £4 off your first order (minimum order £30 excl. shipping). Thanks! Biocidin? is a synergistic combination of botanical medicines which targets the entire GI tract and supports microbiome balance for healthy digestion and elimination. The botanicals also have systemic applications in microbial challenges wherever they occur. Independent laboratory testing has concluded that Biocidin? has broad reaching effects, including addressing biofilms. The formula is available in liquid, liquid filled capsules, liposomal delivery and as a throat spray. Our clinical consultants are happy to assist health professionals in product applications. Suggest using Biocidin Liquid for children. Use 1 - 2 drops of liquid per 10 lbs. of body weight per day divided into 2 - 3 doses. 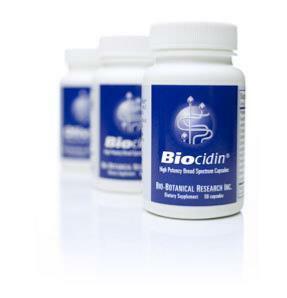 "Biocidin has been the most broadly acting and powerful agent of all the substances evaluated."